Mort Kunstler Handsigned and Numbered Limited Edition Giclee on Canvas:"Lincoln's Inaugural Ball"
About the Art: At the mobbed reception and ball at the White House held on March 5, 1865, the day after the inauguration, Lincoln reportedly shook hands with four thousand well-wishers. 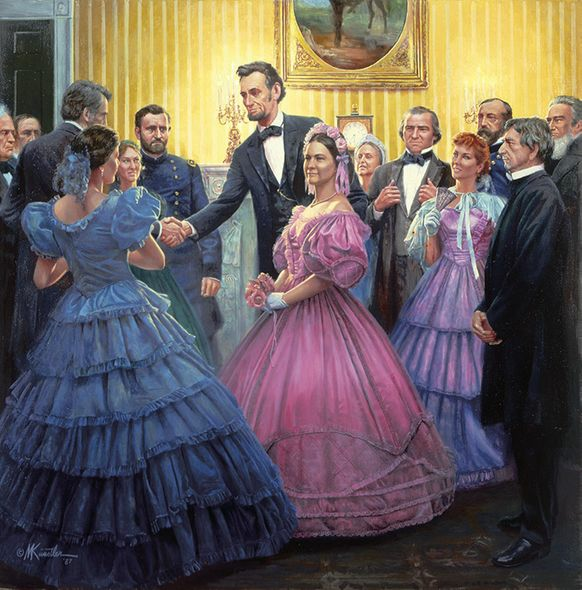 Mary Lincoln's presence was conspicuous. She used the occasion to emerge from three years' mourning for Willie, who had died of typhoid fever at the age of eleven - the second Lincoln son to die tragically young. Untold numbers shoved their way all through the presidential mansion. "The White House," wrote bodyguard William Crook, "looked as if a regiment of rebel troops had been quartered there - with permission to forage."